If you’re an avid reader of my blog, you probably know by now that I’m a sucker for a good cookie, especially one of the sandwich variety. 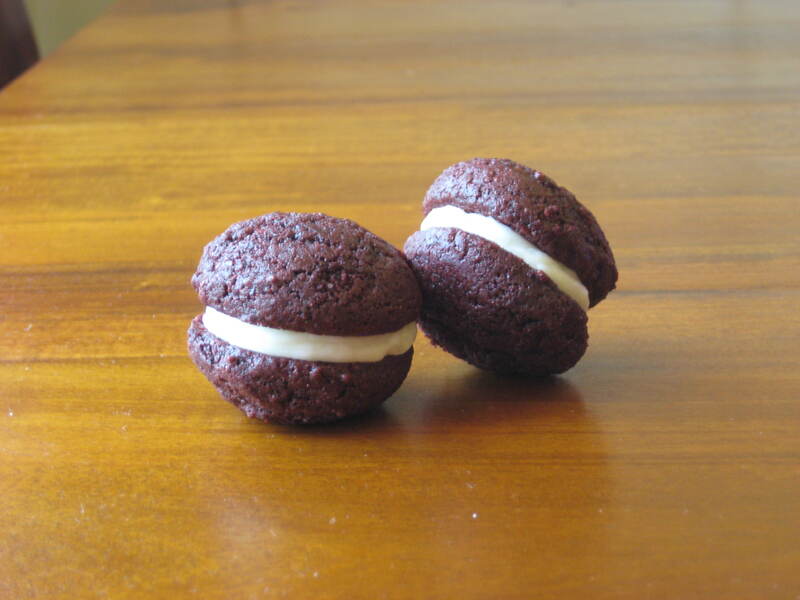 Whoopie pies are no exception here! 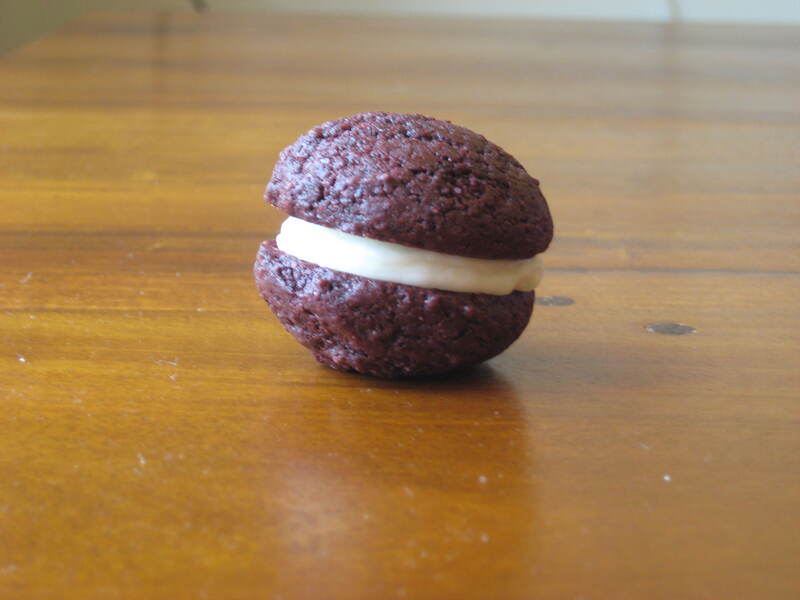 Yesterday I decided to be a tad adventurous and try to come up with my own red velvet whoopie. I mean, I had all this cream cheese lying around… what else was I going to do with it than fill up some sammies? While this recipe is a bit more… time sensitive, I guess, than most cookie recipes, it’s definitely worth the effort when they’re done. I would also strongly suggest baking and filling these cookies the night before you need it, because letting them chill overnight will improve both the taste and texture, leaving you with a moist, tender cookie. Preheat oven to 350F, and line a large baking sheet with parchment paper or a silicon mat. Sift together flour, cocoa powder, and salt. In a bowl of a stand mixer fitted with a paddle, mix together oil and sugar. Add your egg, and mix until combined. Add your dry ingredients, and mix just until combined. With a rubber spatula, scrape bottom of bowl, then turn off mixer. This is where it gets kinda, science experiment-y. In a tall pitcher or glass, combine milk and lemon juice, and let sit about 2 minutes. If it curdles, that’s good! (honestly I only added this step because I was out of buttermilk, and soured milk is a good substitute for that!). Stir in your red food color, and then stir in (quickly!) your baking soda. If you’ve ever made a volcano in science class, you probably recall that baking soda + an acid bubbles up quite a bit! Turn your mixer back on, then with the mixer running, stream your liquid mixture into the batter, scrape the bottom of your bowl, and mix just until all ingredients are incorporated. Scoop (or pipe) out your dough onto your lined sheet pan, and bake for about 7 minutes, or just until tops of cookies are firm. Cool completely before filling. For the filling, I didn’t really use any recipe, I just paddled together cream cheese, a couple tablespoons of lemon juice and some sifted powdered sugar until I got the flavor and consistency that I wanted. Fill yer cookies, store in an airtight container, and chill overnight. Trust me, the waiting makes them taste even better, too!